It only seems logical that the Christian religion was named after its founder Jesus Christ, but alas that is not true. The term Christian had been in use for some time already before Jesus was even born. In a letter, written in 134 CE, from the Emperor Adrian to Servianus it is stated: "Egypt, which you commended to me, my dearest Servianus, I have found to be wholly fickle and inconsistent, and continually wafted about by every breath of fame. The worshipers of Serapis are called Christians, and those who are devoted to the god Serapis, call themselves Bishops of Christ". What is confirmed is that, with the advent of Jesus, the Christ or Christos was not a new term, and there were people throughout the empire who were called Christians prior to the time when the name came to be associated with the followers of Jesus. Serapis preceded Jesus by more than two centuries. More important, though, is the fact that the new pagan converts brought their ideas and beliefs pertaining to the Mithraic Christ into the religion of Jesus. Eusebius, the great historian of the early Church, admits that the religion that is called Christianity was known to the ancients (Eccl. Hist., 1, ch iv) and writes that the religion of Jesus had "...been known among all nations, nevertheless our life and our conduct, with our doctrines of religion, have not been lately invented by us, but from the first creation of man, so to speak, have been established by the natural understanding of divinely favored men of old... What then should prevent the confession that we who are of Christ practice one and the same mode of life and have one and the same religion as those divinely favored men of old? Whence it is evident that the perfect religion committed to us by the teaching of Christ is not new and strange, but, if the truth must be spoken, it is the first and the true religion". To give "Christianity" legitimacy, Rome hijacked the actual foundation, history and persecution of the Nazarenes of the Way to claim as their own and re-labeled them, "Early Christians". Both the New Testament and secular histories had their texts altered to create the impression that Christians / Christianity had a legitimate beginning. In Christian bible translations, Christian appears in three places; Acts 11:26, Acts 26:28, and 1 Peter 4:16. The oldest known Greek manuscript of the New Testament is the Sinaiticus, the second oldest is the Vaticanus. Neither of these texts contain the Greek term Christian. However, copies made after these replace the original Greek term XPHCTIAN (CHRESTIAN) with XPICTIAN (CHRISTIAN). The earliest extant Greek New Testament to explicitly contain the name Christian is the Codex Alexandrinus 450 c.e. This is just far too late for Christian to begin appearing in manuscripts if it were the original term given to followers of the Nazarene Messiah. The appearance of Christian in the Greek text is clearly an anachronism which has been paraded as supporting evidence for the Christian name and faith, both of which are counterfeit. The name Christian did not appear until the 5th Century (perhaps later) having hijacked the name Chrestos which appeared in the earliest known manuscripts. The name appears to have come from an individual named "Chrestus" who led a rebellion and died in 59 AD. Most assume that the name and religion of Christians originated in New Testament times. That Christians are recorded as having thrived in the first century as recorded by certain historians, thus the references to "first-century Christians". However, there is no historical or scriptural trace of Christians or Christianity either in the New Testament or the first century, in name or religion. The evidence shows that Christians arose no earlier than the second century as an anti-Jewish movement that broke away from the Natsraya (Nazarenes). Both the New Testament and secular histories had their texts altered to create the impression that Christians / Christianity had a legitimate beginning. In Christian bible translations, Christian appears in three places; Acts 11:26, Acts 26:28, and 1 Peter 4:16. The oldest known Greek manuscript of the New Testament is the Sinaiticus, the second oldest is the Vaticanus. Neither of these texts contain the Greek term Christian. However, copies made after these replace the original Greek termXPHCTIAN (CHRESTIAN) with XPICTIAN (CHRISTIAN). The earliest extant Greek New Testament to explicitly contain the name "Christian" is the Codex Alexandrinus dated ca. 450 c.e. This is just far too late for "Christian" to begin appearing in manuscripts if it were the original term given to followers of the Nazarene Messiah. The appearance of "Christian" in the Greek text is clearly an anachronism which has been paraded as supporting evidence for the Christian name and faith, both of which are counterfeit. In fact, some lineages of Greek manuscripts (Minuscule 81) were still faithfully copying Chrestian up until 1044 c.e. If you think they mean one and the same thing, they don't (See here and here). Chrestian has no apparent relation to the word Christian although they coincidently appear and sound similar, so much so that during the second century there was some confusion between the terms. Chrestian comes from the Greek chrestoshaving the meaning; good manners or morals, pleasant, better, useful, beneficial, kind, gracious. Christos on the other hand means to be anointed. These are scans from 'The New Strong's Exhaustive Concordance of the Bible'. Although the Greek in the manuscripts appears in upper case, the concordance displays these terms in lower case, but the similarities in appearance can still be observed. The literal translation of Christians is "anointed men" or "anointings". This is far removed from the general meaning ofChrestians which is "good men". Christians are fond of saying that Christian means "follower of Christ", as perhaps it should. That is a platitudinal definition, and it may be the literal one as found in Strong's Concordance, but it isn't the one practiced by Christians. In practical terms, a Christian is one who practices Christianity, just as a Jew practices Judaism, and a Hindu, Hinduism, etc. Who Was Chrestus and Who Killed Him? Cup found in Egypt in 2008 inscribed "Magician Through Chrestus"
It was recently discovered that Christian Scribes had Changed Chrestians to Christians in Tacitus' "History"
Unlike the Testimonium of Josephus or the Nero- blamed-Christians-for-the-fire statement of Tacitus, there appears to be no reason to suspect any interpolation in Suetonius. Consequently, to get rid of the report, Nero fastened the guilt and inflicted the most exquisite punishments on a class hated for their disgraceful acts, called Chrestians by the populace. Christ, from whom the name had its origin. It seems ridiculous to say that Chrestians (the good ones) came from Christ (the anointed one). It is like saying that the followers of Lenin are called Lenenists or the followers of Stalin are called Stalenists, or the followers of Jefferson are called Jiffersonians or the followers of Woodrow Wilson are called Welsonians. It is not an easy thing to get the letters “i” and “e” mixed up in this way. Nobody refers to the founder of Mormonism as Joseph Smeth when they mean Joseph Smith. In order to make a joke out of the discrepancy, Tertullian writes in ad nationes, (circa 200 CE) “Even when by a faulty pronunciation you call us “Chrestians” (for you are not certain about even the sound of this noted name), you in fact lisp out the sense of pleasantness and goodness.” To the rhetorician Tertullian the thought never occurs that the Romans might be a better and more accurate source for the beginning of Christianity than the Christians themselves. Once we accept this, then we have two Roman historians from between 110-120 C.E. mentioning not Jesus or Christ, but a man leading a Jewish rebellion named Chrestus. I proposed a number of years ago that Tacitus originally wrote that Nero sent the Procurator Porcius Festus to put down the Christians/Chrestians. Christian interpolators, misunderstanding, changed it to Pontius Pilate, and they changed Chrestus to Christ and Nero to Tiberius. Consequently, to get rid of the report, Nero fastened the guilt and inflicted the most exquisite punishments on a class hated for their disgraceful acts, called Chrestians by the populace. Chrestus, from whom the name had its origin, suffered the extreme penalty (i.e., Crucifixion) during the reign ofNero at the hands of one of our procurators, Porcius Festus, and a most mischievous superstition, thus checked for the moment, again broke out not only in Judea, the first source of the evil, but even in Rome, where all things hideous and shameful from every part of the world find their center and become popular. 10. Upon Festus’s coming into Judea, it happened that Judea was afflicted by the robbers, while all the villages were set on fire, and plundered by them. And then it was that the sicarii, as they were called, who were robbers, grew numerous. They made use of small swords, not much different in length from the Persian acinacae, but somewhat crooked, and like the Roman sicae, [or sickles,] as they were called; and from these weapons these robbers got their denomination; and with these weapons they slew a great many; for they mingled themselves among the multitude at their festivals, when they were come up in crowds from all parts to the city to worship God, as we said before, and easily slew those that they had a mind to slay. They also came frequently upon the villages belonging to their enemies, with their weapons, and plundered them, and set them on fire. So Festus sent forces, both horsemen and footmen, to fall upon those that had been seduced by a certain impostor, who promised them deliverance and freedom from the miseries they were under, if they would but follow him as far as the wilderness. Accordingly, those forces that were sent destroyed both him that had deluded them, and those that were his followers also. It makes perfect sense for Tacitus to be talking about this “Chrest” who was killed around 59 according to Tacitus. The Christians reading the passage must have thought that Tacitus had heard the wrong story and took the liberty to correct him. The sudden leap back from the time of Nero to the time of Tiberius and leap forward again is what is really disconcerting about the passage. Tacitus would have had to explain more about the suppression of the new superstition if it died out in the 30’s and started again in Rome around in the 60’s. (The Fire was in 64). If the outbreak of the superstition happened in the time of Nero, as Josephus reports, there would be no need to explain what happened. The death of the Christ by Festus would have upset the Jews in Rome. Nero could then place the blame for the fire on them. If we just look at the history by Tacitus and Josephus and stop trying to fit it into the imaginary history of Eusebius, we can see things more clearly. When one investigates the earliest explicit references to "Christian" in the earliest sources of the common era, one comes away empty handed. The earliest evidence is dominated by the occurrence of the term "Chrestian", as is tabulated below. In the Greek language the word Christian is χριστιανος, while the word Chrestian is χρηστιανος. In the Greek manuscript sources which are presented below, the eta (η) invariably occurs instead of the iota (ι). What does this mean? The evidence tabulated below strongly implies that the earliest form of the term "Christian" does not occur until Codex Alexandrinus, at least the 5th century, and may in fact not enter the chronological record [C14!?!] until substantially later. In place of the term "Christian" in the evidence is instead, and quite invariably, is found the term "Chrestian". Some background may be required here. In a separate article the sources of Chrestos and Christos in antiquity are outlined and examined. It must be noted at this point that the term "Christ" in all the Greek manuscript sources is invariably encrypted, or encoded, along with a series of important theological terms, according to a system of abbreviations known as the nomina sacra (Latin; "sacred names"). As a result of this system, the encoded terms "Christ(os)" and "Chrest(os)" cannot be distinguished within this system of encryption, and hence the interest (perhaps even expedience) of locating the expanded and explicit forms in the earliest evidence. One further preliminary article may serve as a necessary background at this point, and that is the investigation of the historical appearance of the "Chi-Rho" code, which is used to represent "Christ" in the manuscript sources, in the non-literary sources outside the Bible tradition. On this series of questions, see Constantine and the Chi-Rho. While the epithet "Christian" certainly appears to have derived from the word "Christ", to an outsider who might not have been necessarily familiar with the association with the adjective χρηστος (good) since the iota of χριστιανος is periodically replaced by aneta. Nevertheless, given the periodic evidence of itacistic changes it is not always clear is such a distinction is being made consciously or whether it is simply a mispronunciation. Indeed, even the Papyrology Unit within the University of Oxford, for the 3rd century P.Oxy 3035, renders the term "Chresian" as "Christian". Various reasons for this type of emendation and/or translation are provided, including misspelling by the original scribes,Iotacism, and orthographic errors. If any of these reasons were correct, then it would be reasonable to expect a mixture of the terms "Chrestian" and "Christian" in the sources, but a mixture is certainly not found. The earliest instance of the term "Christian" in the Greek codices appears in Codex Alexandrinus, which is currently dated to the 5th century, by various methods which are not very secure. Considering the importance of the first historical appearance of the term "Christian" out of many many chronologically prior instances of the original term "Chrestians", then it might be both interesting and expedient to have a fragment of Alexandrinus C14 dated. Oxford Radiocarbon Accelerator Unit: Dyson Perrins Building, South Parks Road, Oxford OX1 3QY U.K.
"The disciples were originally called Chrestians (not Christians) ... at Antioch"
3rd/4th? Lettered Christians: Christians, Letters, and Late Antique Oxyrhynchus by Lincoln H. Blumell χρηστιανος (Chrestian): Papyrus fist published as PSI XIV 1412 and SB VI 9451. Its republication as SB XII 10772 was necessitated ... discovery of an additional piece of this letter in the Florence collection and expanded the text from 16 to 23 lines. (1967) The reading here is "through Sotas the Chrestian". On this reading see see P.Oxy XXXVI 2785 n.2. In this letter a certain Sotas is employed by the author to transport some money from Antioch to Oxyrhynchus. See Luijendijk, "Greetings in the Lord", 136-144. 3rd/4th? Lettered Christians: Christians, Letters, and Late Antique Oxyrhynchus by Lincoln H. Blumell χρηστιανος (Chrestian): Letter. 5th? Lettered Christians: Christians, Letters, and Late Antique Oxyrhynchus by Lincoln H. Blumell χρηστιανος (Chrestian): in the case of P.Oxy.XLIII 3149 the epithet deliberately used as a self-reference, establishing Chrestian authorship. The sender, a certain Horus, writes to a certain Apa Theon in order to recommend another individual. In the opening line of address Heras makes it clear to Apa Theon that he is a Chrestian as he specifically points this out. Translation of P.Oxy.XLIII 3149: "I write to you, Apa Theon, I, Heras, a ChrEstian, greetings in the Lord. I send your slave Heortasius. According to custom grant him anything that you have. This you will find from before the Lord. Also see footnote Orthographic errors (except for lines 3-4 xpn(rho)tiavoc ==> xpi(rho)tiavoc in the original text have not been reproduced but have been corrected in this transcription. 3rd The Oxford Handbook of Roman Egyptedited by Christina Riggs χρηστιανος (Chrestian): List of people nominationed to serve various liturgies in the Fayum. Among the nominess for the position of "supervision of the water-tower and fountains of the metropolis", is the person labelled "Chrestian": "Antonios Dioscoros son of Origen, Alexandrian. A second hand, which provides brief notations of the occupations, abodes, or distinguishing characteristics of those liisted, notes "he is the Dioscoros (who is a) Chrestian." 3rd? A DOCUMENT OF VALERIAN'S PERSECUTION? χρηστιανοι (Chrestian): Official Correspondence. While this text is very fragmentary the term "Chrestian" (χρηστιανοι) can be clearly seen at the beginning of lines 14 and 18. The main interest of the papyrus lies in its mention of Chrestians in the seventh year of an unknown emperor. To sum up, lines 12ff. of P.Oxy. XLIII 3119 contain a copy of a letter from an official of the Saite to an official in another nome (presumably the Oxyrhynchite since the document was found there) relaying orders apparently issued on the authority of the prefect by another Roman official; the latter may have been a procurator since the matter appears to involve the treasury. Whether the original of this letter was for action or just for noting, the circulation of these orders in which Chrestians and their property received a special mention seems to presuppose the existence of legislation dealing specifically with this topic, and also the possibility of its enforcement throughout the country. 3rd? New Testament Greek Manuscripts: Acts - (1996) by Reuben Swanson (Editor) [χρ_]στιανοι (Unknown): Listed separately by Swanson. The text has a lacunae at this place, but there is evidence of an overbar (i.e. "Nomina sacra"). This is unusual, and cannot contribute one way or the other towards "Chrestian" or "Christian". 4th p.nag.hamm.68 = HGV P.Nag Hamm. 68 = Trismegistos 32410 χρηστῷ: The Letter From Harpocration to Sansnos is found in the cartonage of the 7th Nag Hammadi Codex. At line number 12 ("τῇ ἐν Χρηστῷ σου ἀγάπῃ") in context ... "But be diligent beloved, and come to the assistance of your brother; for thus it behooves your charity in "Chrest". Footnotes often refer to this as a "misspelling of Christ". See Nag Hammadi Codices. Greek and Coptic Papyri from the Cartonnage of the Covers, ed. Barns, Browne, and Shelton (Brill, 1981), pp. 62-63.
who is above the Seven, who is within the Seven........."
4th Codex Sinaiticus Online χρηστιανος: The disciples were first called Chrestians in Antioch: the scribe of the Codex Sinaiticus wrote the word chrestianos in the three New Testament passages where that word occurs (Acts 11:26, 26:28 and 1 Pet 4:16). 4th Codex Vaticanus ONLINE The disciples were first called Chreistians in Antioch: Koine Greek often diphthongized the iota into an epsilon-iota and this is the way we find the spelling of "Chreistian" in Codex Vaticanus. .
"I Mani, the Apostle of [Je]su[s] Chrestos (xphctoc) and all the other brethren that are with me ...."
6th What is a Christian? Blaine Robison, M.A The disciples were first called Chreistians in Antioch: Same as Codex Vaticanus. Metzger says that Codex Bezae (6th cent. ), supported by other Western witnesses, reads "Chreistianoi" in Acts 11:26 (344). Bruce M. Metzger, A Textual Commentary on the Greek New Testament, 2nd ed. German Bible Society, 1994. Fragments of Codex Alexandrinus should be C14 dated!!! It would be appropriate to have fragments of this codex C14 dated in order to determine with greater accuracy when the "Christians" appeared in the manuscript tradition. Evidence already exists that scribes altered the original name of the "Chrestians" to the new name of the "Christians". See Tacitus Annals below. New Testament Greek Manuscripts: Acts - (1996) by Reuben Swanson (Editor) MORE but LATE Christian References: The following later later codices witness "Christian" in Acts - Codex Laudianus (6th), Codex H (7th), L (9th), P (9th), Athous Lavrensis (9th), 049 (9th), 056 (10th). Miniscules:: 1 (12th), 88, 104 (dated 1087 CE), 226 (12th), 323 (12th), 330 (12th), 440 (14th), 547 (11th), 614 (13th), 618 (12th), 927 (dated 1133 CE), 945 (11th), 1175 (14th), 1241 (12th), 1245 (12th), 1270 (11th), 1505 (12th), 1611 (10th), 1646 (12th), 1739 (10th), 1828, 1837, 1854, 1891, 2147, 2344, 2412, 2492, 2495. 1st BCE VI24944 (Boman) Latin Chrestianus: In his commentary, Boman refers to an epitaph inscription (CIL VI:24944) dating to possibly before 37 AD/CE that mentions a man named "Iucundus Chrestianus." Philippe Le Bas and William Henry Waddington, Greek Inscriptions grecques et latines recueillies en Grèce et en Asie Mineure (1870), volume 3, inscription 2558. 2nd BCE to 1st CE NBC News Article  and this E-Zine χρηστοu (Chrestos): A bowl discovered in Alexandria, Egypt, and dated to the period from the late second century BCE to the early first century CE bears an engraving that reads: "δια χρηστοu", translated as "through Chrestos," (not "Christ"). Chrestos is a personal name, as well as an adjective meaning "decent" or "useful." The inscription "dia chrestou goistais" probably means "'[Given] through kindness for the magicians.'" The Greek word inscribed is not christos, but chrestos, meaning "kind, loving, good, merciful." (3) Graffito discovered 1897 naming subject of crucifixion as Crestus. ??? the Travels of Dr. Clarke χρηστοu (Chrestos): In the Travels of Dr. Clarke, an inscription is cited as [CHRESTOS PROTOS THESSALOS LARISSAIOS PELASGIOTES ETON IH]; or, "Chrestos, the first, a Thessalonian from Larissa, Pelasgiot 18 years old Hero." Dr. Clarke shows, the word Chrestos is found on the epitaphs of almost all the ancient Larissians; but it is preceded always by a proper name. 100-165 CE Apology 1, ch. 4 "By the mere application of a name, nothing is decided, either good or evil, apart from the actions implied in the name; and indeed, so far at least as one may judge from the name we are accused of, we are Chrestians. But as we do not think it just to beg to be acquitted on account of the name, if we be convicted as evil-doers, so, on the other hand, if we be found to have committed no offense, either in the matter of thus naming ourselves, or of our conduct as citizens, it is your part very earnestly to guard against incurring just punishment, by unjustly punishing those who are not convicted." 150-211 CE Stromata IV "Now those who have believed in Christ both are and are called Chrestians, as those who are cared for by the true king are kingly. For as the wise are wise by their wisdom, and those observant of law are so by the law; so also those who belong to Christ the King are kings, and those that are Christ’s Christians." 160-224 CE Apology Ch.III "Now then, if this hatred is directed against the name, what is the guilt attaching to names? What accusation can be brought against words, except that a certain pronunciation of a name sounds barbarous, or is unlucky or abusive or obscene? But 'Christian,' as far as its etymology goes, is derived from 'anointing.' And even when it is incorrectly pronounced by you 'Chrestian' (for not even is your acquaintance with the name accurate), it is formed from 'sweetness' or 'kindness.' In innocent men, therefore, even an innocent name is hated." 240-320 CE Divine Institutes, Book IV Ch. VII "...for Christ is not a proper name, but a title of power and dominion; for by this the Jews were accustomed to call their kings. But the meaning of this name must be set forth, on account of the error of the ignorant, who by the change of a letter are accustomed to call Him Chrestus. The Jews had before been directed to compose a sacred oil, with which those who were called to the priesthood or to the kingdom might be anointed. And as now the robe of purple is a sign of the assumption of royal dignity among the Romans, so with them the anointing with the holy oil conferred the title and power of king. But since the ancient Greeks used the word χρίεσθαι to express the art of anointing, which they now express by ἀλείφεσθαι, as the verse of Homer shows, “But the attendants washed, and anointed them with oil;” on this account we call Him Christ, that is, the Anointed, who in Hebrew is called the Messias. Hence in some Greek writings, which are badly translated from the Hebrew, the word eleimmenos is found written, from the word aleiphesthai, anointing. But, however, by either name a king is signified:"
As a result of this situation - that the term "Chrestian" (and not "Christian") invariably appears with the earliest evidence - the question must naturally arise as to why. How is the chronology of the use of the terms "Chrestian" and then "Christian" to be explained? 1. Before c.316 CE: There appears to have been a class of people in antiquity who were referred to as "Chrestians". 2. After c.316 CE: Constantine uses this name as the name of the "Chrestian State Religion", associated with the sacred code "Chi-Rho". 2.00) Manuscript Evidence: "not known"
Carolingian minuscule: Carolingian or Caroline minuscule is a script developed as a calligraphic standard in Europe so that the Latin alphabet could be easily recognized by the literate class from one region to another. It was used in the Holy Roman Empire between approximately 800 and 1200. Codices, pagan and Christian texts, and educational material were written in Carolingian minuscule throughout the Carolingian Renaissance. The script developed into blackletter and became obsolete, though its revival in the Italian renaissance forms the basis of more recent scripts. There are two very powerful points to consider regarding the "Chrestos Mithras" connection to the Roman creation of "Christos". The Vatican is built upon a pagan necropolis burial ground and besides artwork of Lucifer in the bowels of its lower chambers, there is the following Chrestos Mithras tauroctony bas-relief in the Vatican museum. CIMRM 554-555 - "Chrestus the pater and Gaurus" tauroctony. Vatican, Rome. From: here. April 2010. By Tim Whitehill. 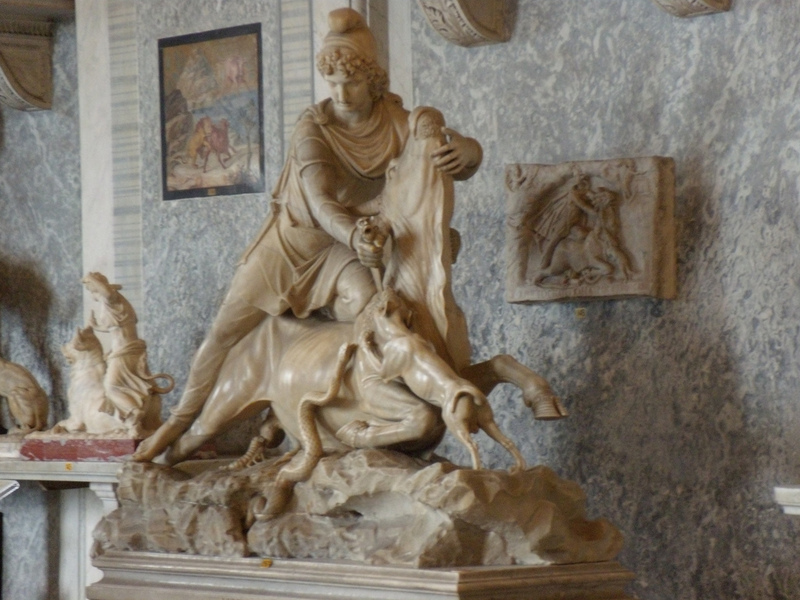 Location of the relief in the room of the animals in the Vatican museum, behind CIMRM 548. From:Flickr. By Mary Lou Burke, 2010. A tauroctony bas-relief with a Greek inscription. It may be found in the Vatican museum, in the room of the animals, and is behind the large free-standing tauroctony of CIMRM 548. Note that casual visitors are not allowed into the room (in 2014), but must remain behind the rope in the corridor, which is why all the photos are from one side. White marble relief (H. 0.43 Br. 0.72 D. 0.05), broken in two. Vatican Museum, Sala dei Animali, No. 149. Zoega, Abh., 149 No. 15; Gerhard-Platner, 198 No. 34; MMM II 211f No. 31; Amelung, Skulpt. Vat., II (1), 46 No. 17 and Taf. 5. See fig. 158 (Sansaini). Kaibel, 151, 1272; MMM II No. 39.
ἐποίησαν in the sense of consacraverunt. I.e. "Chrestus the Pater, and Gaurus, dedicated this." Roger Pearse, "According to Realencyclopaedie, the inscription Chrestos is to be seen on a Mithras relief in the Vatican", April 1, 2011. Wherefore also the evil demons in mimicry have handed down that the same thing should be done in the Mysteries of Mithras. For that bread and a cup of water are in these mysteries set before the initiate with certain speeches you either know or can learn. Ernest Renan suggested in 1882 that, under different circumstances, Mithraism might have risen to the prominence of modern-day Christianity. Renan wrote: "if the growth of Christianity had been arrested by some mortal malady, the world would have been Mithraic…" However, this theory has since been contested: Leonard Boyle wrote in 1987 that "too much ... has been made of the 'threat' of Mithraism to Christianity," pointing out that there are only fifty known mithraea in the entire city of Rome. J. Alvar Ezquerra holds that since the two religions did not share similar aims, there was never any real threat of Mithraism taking over the Roman world. According to Mary Boyce, Mithraism was a potent enemy for Christianity in the West, though she is sceptical about its hold in the East. Filippo Coarelli (1979) has tabulated forty actual or possible Mithraea and estimated that Rome would have had "not less than 680–690" mithraea. Lewis M. Hopfe states that more than 400 Mithraic sites have been found. These sites are spread all over the Roman empire from places as far as Dura Europos in the east, and England in the west. He too says that Mithraism may have been a rival of Christianity. 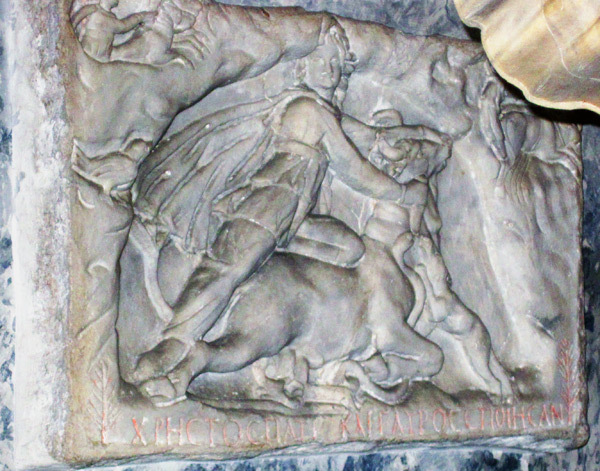 David Ulansey thinks Renan's statement "somewhat exaggerated", but does consider Mithraism "one of Christianity's major competitors in the Roman Empire". Ulansey sees study of Mithraism as important for understanding "the cultural matrix out of which the Christian religion came to birth". 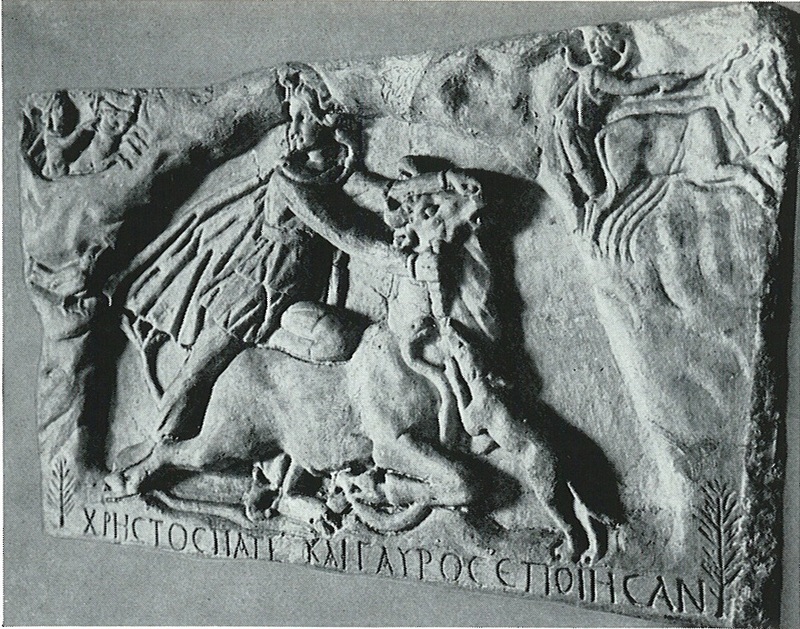 The Mithraic Mysteries were a mystery religion practiced in the Roman Empire from about the 1st to 4th centuries AD . The name of the Persian god Mithra (proto-Indo-Iranian Mitra), adapted into Greek asMithras, was linked to a new and distinctive imagery . Writers of the Roman Empire period referred to this mystery religion by phrases which can be anglicized as Mysteries of Mithras or Mysteries of the Persians; modern historians refer to it as Mithraism, or sometimes Roman Mithraism. Worshippers of Mithras had a complex system of seven grades of initiation, with ritual meals. Initiates called themselvessyndexioi, those "united by the handshake". They met in underground temples (called mithraea), which survive in large numbers. The cult appears to have had its centre in Rome. The Romans themselves regarded the mysteries as having Persian or Zoroastrian sources. Since the early 1970s, however, the dominant scholarship has noted dissimilarities between Persian Mithra-worship and the Roman Mithraic mysteries, and the mysteries of Mithras are now generally seen as a distinct product of the Roman Imperial religious world. In this context, Mithraism has sometimes been viewed as a rival of early Christianity. According to M.J.Vermaseren, the Mithraic New Year and the birthday of Mithras was on December 25. The Christian (Chrestian) religion is based on the Mystery Babylonian Mithraic religion meshed with the heretical doctrines of Paul whose followers were called Chrestianos Acts 11:26 (not Nazaraioi - Nazarenes) - who followed a Roman insurrectionist titled "Chrestos" - (not Nazaraios - the Nazarene) - whose pagan doctrines are not of the Creator Father's Law/Torah (the Way) but rather those of Chrestos Mithras who is commemorated in the Vatican museum. Paul is said to have arrived in Rome c. 60 and spent another two years under house arrest (beyond his two years in prison in Caesarea). [Acts 28:16] Neither the Bible nor other sources say how or when Paul died, but Ignatius, probably around 110, writes that Paul was martyred. Christian tradition holds that Paul was beheaded in Rome during the reign of Nero around the mid-60s at Tre Fontane Abbey (English: Three Fountains Abbey). Tacitus would have had to explain more about the suppression of the new superstition if it died out in the 30’s and started again in Rome around in the 60’s. (The Fire was in 64). If the outbreak of the superstition happened in the time of Nero, as Josephus reports, there would be no need to explain what happened. The death of the Christ by Festus would have upset the Jews in Rome. Nero could then place the blame for the fire on them. "Since the Jews constantly made disturbances at the instigation of Chrestus, he [the Emperor Claudius] expelled them from Rome." The passage may suggest that in the mid-first century the Romans still viewed Christianity as a Jewish sect. Historians debate whether or not the Roman government distinguished between Christians and Jews prior to Nerva's modification of the Fiscus Judaicus in AD 96. From then on, practising Jews paid the tax, Christians did not. Seutonius was definitely not referring to the nickname or given name of a local Jewish agitator named “useful one”: he tells us elsewhere that “foreigners” like Jews were not allowed to adopt such Greco-Roman names. Since these radical Jews were likely following someone who was "Jewish", it must follow that “Chrestus” is a reference to a "Jew" who was not present for these actual events (Paul?). Editor's Note: The supposed time of Paul's (Chrestus?) death above coincides about the time of the expulsion of "Jews" from Rome. Nazarenes of the Way were clearly NOT "early Christians (Chrestians)"